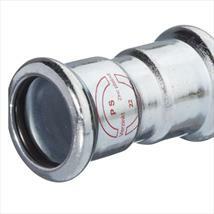 M-Press Fittings are the UK's latest manufacturer and supplier of mechanical press fittings. Following the popular 'M-Profile' press design, M-Press have introduced a range of mechanical press fittings for the commercial plumbing sector. - M-PRESS-SS (Stainless Steel): High-alloy, austenitic, non-rusting Cr-Ni-Mo steel with material no.1.4404 (AISI 316 L) according to EN-10088. Diameters correspond to the requirements of EN-10312 and/or DVGW GW 541. - M-PRESS-STEEL (Carbon Steel): Unalloyed steel pressfittings and pipes An electroplated layer of zinc protects against external corrosion. - M-PRESS-COPPER: Copper and bronze pressfittings for commercial copper pipes. A contoured EPDM elastomer is used to make the connection impermeable. The inseparable, permanently impermeable, friction-locking press connection actuated by longitudinal and profile forces is achieved by cold forming the system press fittings. The creation of such a connection is executed with the aid of the pressing tool - like the M-PRESS SPM19 Battery-Powered Hydraulic Mini Pressing Tool.